UNIVERSE DISCOVERIES: Are we closer to discover Dark Matter? Are we closer to discover Dark Matter? Dark matter makes up about 23 percent of the mass-energy content of the universe, even though we don’t know what it is or have yet to directly see it (which is why it’s called “dark”). So how can we detect it and when we do, what will it reveal about the universe? In mid-October, more than 100 cosmologists, particle physicists and astrophysicists gathered for a meeting called "Dark Matter Universe: On the Threshold of Discovery" at the National Academy of Sciences’ Beckman Center in Irvine, CA. Their goal: to take stock of the latest theories and findings about dark matter, assess just how close we are to detecting it and spark cross-disciplinary discussions and collaborations aimed at resolving the dark matter puzzle. The image above is one of the most detailed maps of dark matter in our universe ever created. The location of the dark matter (tinted blue) was inferred through observations of magnified and distorted distant galaxies seen in this picture. "Figuring out what is dark matter has become a problem that astrophysicists, cosmologists and particle physicists all want to solve, because dark matter is central to our understanding of the universe," says Michael S. Turner – Rauner Distinguished Service Professor and Director of the Kavli Institute for Cosmological Physics at the University of Chicago. "We now have a compelling hypothesis, namely that dark matter is comprised of WIMPs (Weakly Interacting Massive Particle), particles that don’t radiate light and interact rarely with ordinary matter. After decades of trying to figure out how to test the idea that dark matter is made up of WIMPs, we have three ways to test this hypothesis. Best of all, all three methods are closing in on being able to either confirm or falsify the WIMP. So the stars have truly aligned." Maria Spiropulu – Professor of Physics at California Institute of Technology who also works on experiments at the Large Hadron Collider, and a former fellow at the Enrico Fermi Institute, observed that "One important thing we’ve seen at this meeting is a crossing of professional boundaries that have separated researchers in many different fields in the past. These boundaries have been strict. Cosmologists, astrophysicists and particle physicists, however, have now really started talking to one another about dark matter. We’re only beginning and our language – the way speak to each other – is not yet settled so that we completely understand each other; but we are on the threshold of discovering something very important for all of us. This is critical because cosmologists and particle physicists have talked for a long time about how the very big and very small might be linked. And while the particle physicists study the very small with colliders, cosmologists study the galaxies and billions and billions of stars that make up the large-scale structure we see in the universe." "The convergence of inner space and outer space really started in the 1980s, said Turner. "Back then it began with the origin of the baryon asymmetry, the monopole problem and dark matter to a lesser extent. Particle physicists agreed that dark matter was a real problem but said, “The solution could be astrophysics – faint stars, ‘Jupiters’, black holes and the like.” It’s been a long road to get to where we are now, namely where we all agree that the most compelling solution is particle dark matter. And even today, the different fields are still, in a sense, getting to know one another." "As cosmologists," said Rocky Kolb, who studies the application of elementary-particle physics to the very early Universe, and is the co-author with Michael Turner of The Early Universe, the standard textbook on particle physics and cosmology, "one of our jobs is to understand what the universe is made of. To a good approximation, the galaxies and other structures we see in the universe are made predominantly of dark matter. We have concluded this from a tremendous body of evidence, and now we need to discover what exactly is dark matter. The excitement now is that we are closing in on an answer, and only once in the history of humans will someone discover it. There will be some student or postdoc or experimentalist someplace who is going to look in the next 10 years at their data, and of the seven or so billion people in the world that person will discover what galaxies are mostly made of. It's only going to happen once." "The dark matter story started with fragmentary evidence discovered by Fritz Zwicky, a Swiss American," Turner pointed out. "He found that there were not enough stars in the galaxy clusters he observed to hold them together. 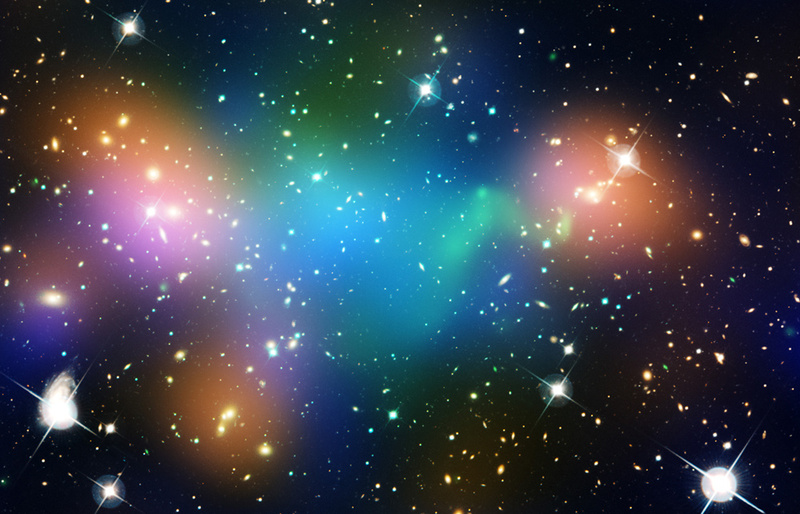 Slowly, more was understood and finally dark matter became a centerpiece of cosmology. And now, we have established that dark matter is about 23 percent of the universe; ordinary matter is only 4½ percent; and dark energy is that other 73 percent – which is an even bigger puzzle. Nothing in cosmology makes sense without dark matter. We needed it to form galaxies, stars and other structures in the Universe. And so it's absolutely central to cosmology. We also know that none of the particles known to exist can be the dark matter particle. So it has to be a new particle of nature. Remarkably, our most conservative hypothesis right now is that the dark matter is a new form of matter – out there to be discovered and to teach us about particle physics. An experimental particle physicist, Maria Spiropulu is interested in the search for dark matter at the Large Hadron Collider at CERN (The European Organization for Nuclear Research), and questions about dark matter that cut across particle physics, astrophysics and cosmology." Maria Spiropulu added that "The phenomenon of dark matter was discovered from astronomical observations. We know that galaxies hang together and they don't fly apart, and it’s the same with clusters of galaxies. So we know that we have structure in the universe. Whatever it is that keeps it there, in whatever form it is, we call that dark matter. This is the way I teach it to undergraduates. It’s a fantastical story. It's still a mystery and so it’s “dark,” but the universe and its structures – galaxies and everything else we observe in the macroscopic world – are being held together because of it." "Dark matter is absolutely central to cosmology, said Turner, "and the evidence for it comes from many different measurements: the amount of deuterium produced in the big bang, the cosmic microwave background, the formation of structure in the Universe, galaxy rotation curves, gravitational lensing, and on and on." What is dark matter? We don’t know, but cosmologists, astrophysicists and experimental particle physicists say they are closing in on an answer.Knowing exactly what dark matter is is less important than the work done already – measuring its gravitational influence on ordinary matter, estimating how much of the universe is made from it, and affirming that what we do know about it fits with the standard model of cosmology. "There is five times more dark matter than ordinary matter, and its existence allows us to understand the history of the universe beginning from a formless particle soup until where we are today," said Turner. "If you said, 'You no longer have dark matter,' our current cosmological model would collapse. We would be back to square one." "The hypothesis that dark matter is made up of WIMPs – and that it was produced by normal particles, say quarks, in the early universe – is an amazing achievement all by itself, observed Kolb. "Independent of a lot of the details of what goes on there and exactly how that happens, we expect that you should be able to reverse things and produce WIMPs in particle accelerators. We also expect they should be annihilating today in the galaxy, which we should be able to detect indirectly. Now, it's another issue who will be the first to find WIMPs. It's possible that it will be another 30 years before we do that, but we should be able to make a detection – whether it’s direct or indirect." Marion Spiropulu answered that "With the Large Hadron Collider, and before that the Tevatron collider, we have been chasing and targeting the dark matter candidate. For us, the optimism is because the LHC is working and we’re collecting a lot of data. In the standard model of particle physics, when we enlarge it to help explain how the universe began and evolved, we have a story that is a mathematical story. 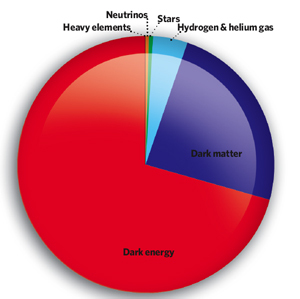 It’s very good at describing how we can have dark matter. And if the mathematics accurately describes reality, then the LHC is now achieving the energies that are needed to produce dark matter particles. Getting to these high energies is critical, and we are even going to higher energies. When we were building the standard model of particle physics, we kept saying that the next particle discovery that we predicted was 'right around the corner. 'In other words, we were not, and we are not, flying in the dark. We are guided by a huge amount of data and knowledge, and while you might think there are infinite possibilities of what can happen, the data actually points you to something that is more probable. For example, we have found the Higgs-like particle, but that was predicted. So the next big step for this edifice of knowledge is to find something that will look like supersymmetry – a hypothesis that, if true, offers a perfect candidate for dark matter. We call it a miracle, because the mathematics works. But the way nature works, in the end, is what you see in the data. So if we find it, there is no miracle." "Dark matter particles, or WIMPs," said Turner, "don’t interact with ordinary matter often. It's taken 25 years to improve the sensitivity of our detectors by a factor of a million, and now they have a good shot at detecting the dark matter particles. Because of the technological developments, we think we are on the cusp of a direct detection. Likewise for indirect detection. We now have instruments like the Fermi satellite (the Fermi Gamma-ray Space Telescope) and the IceCube detector (the IceCube Neutrino Observatory at the South Pole) that can detect the ordinary particles (positrons, gamma rays or neutrinos) that are produced when dark matter particles annihilate, indirectly allowing dark matter to be detected. IceCube is big enough to detect neutrinos that are produced by dark matter annihilations in the sun." Answering the observation that the dark matter particle might not be detectable, Turner said that for 20 to 30 years, this idea that dark matter is part of a unified theory has been our Holy Grail and has led to the WIMP hypothesis and the belief that the dark matter particle is detectable. "But there’s a new generation of physicists that is saying, 'Well, there's an alternative view. Dark matter is actually just the tip of an iceberg of another world that is unrelated to our world. And I cannot even tell you about that world. There are no rules for that other world, at least that we know of yet.' Sadly, this point of view could be correct and might mean the solution to the dark matter problem is still very far away, that discovering what dark matter actually is could be 100 years away. Michael Witherell, Professor of Physics at the University of California, Santa Barbara, said that nature doesn't guarantee an observation, which Turner said is ture. But that we have the WIMP hypothesis and it is falsifiable. And there's a good chance it's true. A “good chance” in this business means 10 percent or 20 percent. *"It's easy to say that wimps will be discovered in “A decade.” said Kolb. "LHC is turning on now. It'll be another year or so before they are at full energy, and they may run a couple of years to accumulate data. Meanwhile, the Fermi satellite is in space making observations. And then we have experiments underground: a detection may come with Xenon100, one dark matter experiment now underway in central Italy, or some successor to Xenon100. In ten years, if there is no indication of supersymmetry or a WIMP – either from direct detection or indirect detection searches – then there is going to be a sea change. Now, there is not going to be one experiment announcement that says, 'OK, let's look at something else.' But if ten years from now there is no evidence, then we are going to other possibilities. You could not have said that ten years ago, or even five years ago. Today, I think you can say that." "Ee need to discover what exactly is dark matter. The excitement now is that we are closing in on an answer, and only once in the history of humans will someone discover it." said Rocky Kolb.